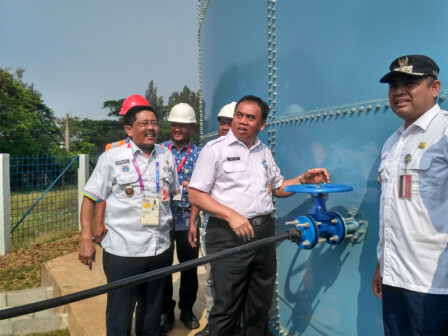 City Provincial Government has inaugurated the Sunter booster pump and reservoir operational on Jalan Sunter Permai Raya, Sunter Agung Urban Village, Tanjung Priok, North Jakarta, Wednesday (8/15). Besides increasing public service, its existence is also to ensure the water supply towards the Kemayoran athletes' homestead.
" One person's water needs are around 60 liters. This is prepared for athlete's homestead around 40 liters per second, which is sufficient"
City Secretary, Saefullah, appreciated the efforts of Aetra and PDAM to ensure the operation of the installation prior to the Asian Games. By so, the supply of clean water at athlete's homestead can be fulfilled. "One person's water needs are around 60 liters. This is prepared for athlete's homestead around 40 liters per second, which is sufficient," he stated. He explained that the booster pump has a compressive capacity of up to 800 liters per second. While for the reservoir has a capacity of up to 2,500 cubic meters. The existence of the reservoir is also aimed to secure water availability in the event of a power outage. Then the existence of the booster pump also provides improved water flow services to people's homes in Pademangan Timur, Ancol, Kemayoran, and Gunung Sahari Selatan areas. "From now on, the pressure of 0.5 meters can be 4 meters up to the homes of residents. We will make sure PLN can meet the electricity supply," he uttered.